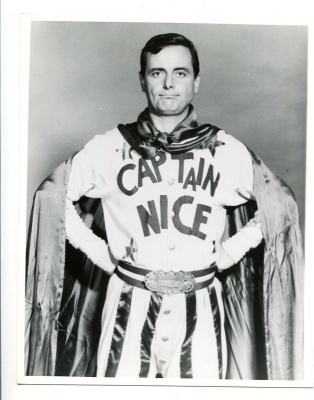 William Daniels as mild mannered (Mama's boy) Carter Nash who discovered a potion that turns him into a superhero. Music by Vic Mizzy. Captain Nice (alias Carter Nash, same intials) was played by William Daniels who you probably remember better as Mr. Braddock in The Graduate, the voice of K.I.T.T. on Knight Rider, Mark Craig on St. Elsewhere, and George Feeney on Boy/Girl Meets World. That year marked two of my favorite tv comedies of all time and I was really disappointed they both only lasted one year...they were MR. TERRIFIC and Captain Nice!